Can you find your favorite Bible translation on this chart? What do you think? Update: Here is another translation chart from the NLT site. It has been truly wonderful that HarperCollins has come out in recent years with new editions of the NRSV, in particular specifically Catholic versions. This edition has many good qualities, but falls short in two important areas in my opinion. 1) The size is really nice....not too big, yet not too small. 2) I really like the single column format for many of the Biblical books. I am not sure why more Bible publishers don't do this. The only Catholic Bible that I am aware of that does this is the Jerusalem/New Jerusalem Bible. Although, on second thought, I think the Navarre Bible Commentary uses the single-column format as well. I have always found single-column formats to be easy on the eyes and they often provide ample marginal space for personal notations. 3) The overall product has a feel of being made well. It opens up nice on a table or in your lap when sitting in a chair. 1) The paper is way too thin! The bleed-through, if you use pen or pencil is very distracting. It is actually quite shocking! 2) I would have liked to see a few more things added to this volume, like some basic Bible maps, modest cross-referencing, and maybe the three year Sunday Mass readings. For such a beautifully constructed Bible, it would have been nice to see them go the extra step. Overall, I think HarperCollins has taken a great step in the positive direction, but I hope any future editions will go the next step. Hopefully we will continue to see more quality editions produced. How about a thin-line edition? Those of us involved in church ministry are familiar with the Catholic Updates, which is a parish resource that can be placed inside Sunday bulletins. I recently spotted this one which deals with Bible translations. Although it is a few years old, I think it is a nice overview of the various Catholic Bible translations. I was very excited when the Ignatius RSV - Second Catholic Edition was published a few years back. It seemed like it would be the perfect Bible for Catholics who love the RSV. However I must say that I found myself not completely satisfied. 2) The cover is beautiful. One immediately knows you are reading the Bible! 3) The inclusion of maps at the back is much needed. 4) They added chapter headings, which is far superior to the crunch together text of the original Ignatius Bible. 1) Depending on the lighting of the room, I find the paper and page lay-out to be at times unreadable. (BTW, I am not old nor do I wear glasses) The paper just seems too glossy. 2) There is no information provided to tell the reader which changes were made to the text. 3) I am surprised that there are not any editional study helps, like a concise concordance or Mass Readings or Dei Verbum. Why be so minimal in what you include between the covers? Ultimately, is this edition better than the older editions of the RSV-CE? Yes, it is certainly a nice upgrade. But it is certainly not ideal in my mind, and seems to have been hastly put together. More importantly, I have emailed Ignatius Press requesting information about all the textual changes that they made, along with asking who was in charge of making these changes. Unfortunately, they wouldn't share that information. That seems just a bit fishy to me, and I am one who buys a lot of books from Ignatius Press. I am uncomfortable using a translation edited or altered by people unknown. Also, I must say that I am also concerned with the slowness that Ignatius Press has taken in putting together its Ignatius Study Bible. Because they take so long to release each new small edition, I have decided to stop buying them until a complete one-volume edition is produced. When completed, I would be interested in using such a text as my main Bible for study and in ministry work. Yet, when will it be finished? All indications are that it will still be many years. Now I understand the Ignatius has decided to put out 4-5 Pope Benedict books a season, but surely there must be room to complete this project. I reckon that Pope Benedict, himself, would deem this more important that putting out another collection of his works. The Catholic Study Bible, Second Edition is again published by Oxford University Press. Once again, the New American Bible is the translation used in this edition. This will certainly be welcome by many American Catholic's, whose primary Bible is the NAB. The first edition came out in 1990 and was known for its extensive study guides and quality of production that Oxford is known for. As a matter of fact, one of the reasons I like the first edition was because it provided a lot space in the margins for study notes. Very nice! 1) I really don't see the need in revising the older edition. To be honest, much of the material remains the same as in older versions. The textual notes, which come with all NAB's, are the standard notes that come with every NAB edition. In addition, the inclusion of expanded reading guides and the terribly bland looking in-text maps seems to be hastly arranged. However, the addition of a concordance in the back was a good idea. 2) I dislike the visual format of this edition. Personally, the original 1990 version of the Catholic Study Bible is much better. Does anyone else find the print too light? Also, the cross-referencing apparatus I think is not helpful, as well as the divide between the Sacred Text and the notes, which seems too similar. How about coming up with a one column study Bible, like the Jerusalem and New Jerusalem Bibles? 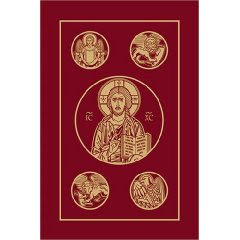 While there are other study Bibles for Catholics in the process of being developed, like the Ignatius Study Bible, I am not sure this version is going to stand the test of time. I would rather use an older edition of The Catholic Study Bible or the much better HaperCollins Study Bible. WASHINGTON (CNS) -- In the not-too-distant future, songs such as "You Are Near," "I Will Bless Yahweh" and "Rise, O Yahweh" will no longer be part of the Catholic worship experience in the United States.At the very least, the songs will be edited to remove the word "Yahweh" -- a name of God that the Vatican has ruled must not "be used or pronounced" in songs and prayers during Catholic Masses.Bishop Arthur J. Serratelli of Paterson, N.J., chairman of the U.S. bishops' Committee on Divine Worship, announced the new Vatican "directives on the use of 'the name of God' in the sacred liturgy" in an Aug. 8 letter to his fellow bishops. He said the directives would not "force any changes to official liturgical texts" or to the bishops' current missal translation project but would likely have "some impact on the use of particular pieces of liturgical music in our country as well as in the composition of variable texts such as the general intercessions for the celebration of the Mass and the other sacraments." The only Catholic translation that I am aware of that this would effect would be the Jerusalem and New Jerusalem Bibles. However, foreseeing this possibility, the Catholic Truth Society in London recently published the The CTS New Catholic Bible, which uses the original Jerusalem Bible, with Grail Psalms. What makes this edition even more unique is the fact that they changed the YHWH renderings to the LORD, which is standard in most Bibles. You can see more about this edition here. 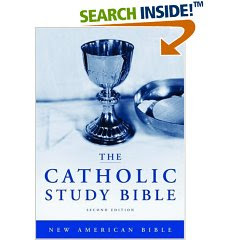 In addition to U.S. and Canadian imprimaturs, the Reader's Text contains "The Dogmatic Constitution on Divine Revelation", 64 in-text maps, 12 in-text charts and line drawings, a unique NRSV Catholic concordance, a Presentation and Family Record Section, eight pages of full color New Oxford Bible Maps, Prayers and Devotions of the Catholic Faith, and a Table of Sunday and Weekday Lectionary Readings for the Canadian NRSV Lectionary. 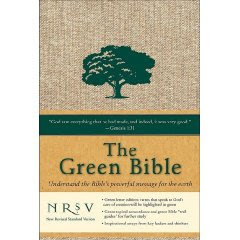 I must say that I find this edition of the NRSV a true joy to read and use daily. I own a burgundy berkshire leather edition, although I am still unsure as to what berkshire leather actually is. It doesn't feel like the rather cheap bonded leather that you sometimes see used in Bibles, but it certainly is not lamb-skin either. (The fact that I paid a decent amount for it suggests to me that it is a better quality leather binding.) The Bible fits nicely in the hand and will open up flat when placed on a table. It's size is 9.9 x 7.5 x 1.8 inches and it weights only 3 pounds, making it very easy to take with you to Bible studies, Holy Mass, or Panera. In addition, the text size is very readable, the print is clear, it containts paragraph headings, and there is a fair amount of space to write notes if desired. Probably the main reason I like this Bible is that it contains a lot of Bible extras, something that most Bibles of this size do not. One thing that I love the most is that it contains a lot of maps and charts. Not only do you get the standard "Oxford Maps" in the back, but there are a ton of in-text maps placed throughout the Bible at appropriate places. For example, if you are reading through 1 Samuel about David fleeing from King Saul, you will find in 1 Samuel 22 a nice in-text map of David's escape route to En Gedi. In the New Testament, there are some wonderful maps of "Jerusalem during Jesus Time" as well maps of the individual cities that Paul visited. In addition to the maps, there are some very helpful charts placed within the text, like a "Harmony of the Gospels" and "Chronology of the Postexilic Era" in the Book of Ezra. The appendix includes the full table of Mass readings for Sundays and Weekdays, which is really nice to have when taking this Bible to Mass. There is also a nice 6 page section on Catholic prayers and devotions. Finally, there is a concise NRSV concordance in the back. This 100 page concordance, which helps you to find familiar phrases and words in the Bible, is the most thorough concise concordance that I have seen for a Bible this size. It is particularly helpful when looking up a Biblical name or place. The one drawback to this Bible is that it doesn't contain any cross-references. Certainly having the concordance helps that a bit, but overall it would have been nice to have cross-references for those passages that are explicitly quoted elsewhere in the Bible. Overall, this is a great Bible! 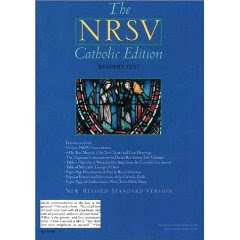 I would highly recommend it to anyone looking for an NRSV Catholic edition. This is the first post for this brand new blog devoted to Catholic Bible translations and resources. I intended this blog to be a place for spirited, yet charitable, discussion about the various issues that go into the whole issue of Bible translation within the Catholic Church. It is my hope that many Catholics (and all who will read this blog) will come to appreciate the various Catholic Bible translations, from the Douay-Rheims to the NRSV-CE. I also plan to update regularly the various Bible resources that become available.